If you've had cataract surgery, you probably remember the excitement you felt as you steadily recovered your vision. Your world suddenly became more vivid and colorful. You probably started enjoying things that your poor vision had denied you. However, lately you have noticed a steady decrease in your vision. You may have a secondary cataract. Cloudy vision as a result of a secondary cataract can easily be corrected with a 5-7 minute procedure with a YAG laser. To understand why your vision can become cloudy after surgery, you must first understand cataract surgery. A cataract is a clouding of the lens of the eye. Cataract surgery can best be explained when the lens of the eye is compared to a baked potato. During surgery, a small hole is made on the top of the potato, and the inside of the baked potato is removed, leaving the “hollow skin”. The implant is placed in between, and the skin acts as support for the implant. If this skin or membrane were not left intact, the implant would fall back into the back of the eye. Sometimes the "skin or membrane" can wrinkle and become cloudy. 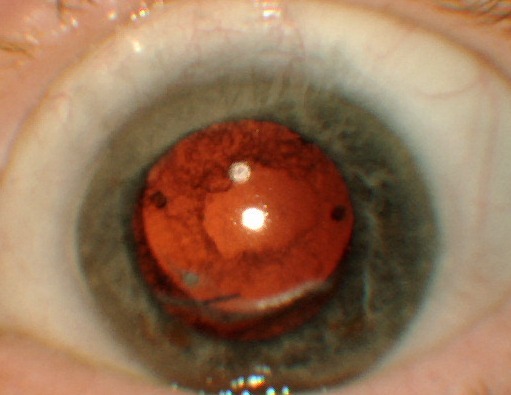 This is called a secondary cataract. Many people who experience this describe it by saying, "My cataract grew back." What has really happened is that your vision has become blurry again because once clear membrane has lost it's transparency. Making an opening or window in the center of this cloudy membrane with a YAG laser allows you to see clearly again. This procedure takes about 5-7 minutes, is done in the cataract surgeon's office, and is never needed again. Second cataract formation (film or cloudiness of the capsule) occurs from 1 month to years after initial cataract surgery. Above: graphic of a Yag laser procedure. After an in office Yag laser to create a clear center hole. Because this membrane is so thin, actual surgery is not needed to remove it. YAG laser light creates a hole in the membrane with no cutting necessary. 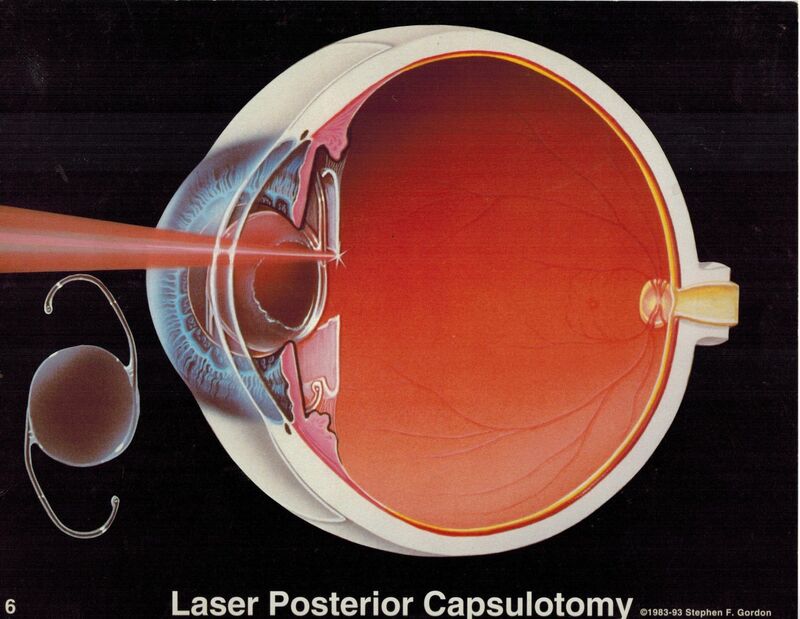 This laser surgery, known as a YAG laser posterior capsulotomy, requires no anesthesia other than eye drops. This is done at the cataract surgeon's office. This 5-7 minute procedure is performed in the office. Bursts of YAG laser energy vaporize the center of the cloudy membrane and restore your vision within minutes. Since the laser energy enters the eye without cutting it from the outside, there is no risk of infection. Like any surgical procedure, however, there are possible side effects. The eye may develop a rise in pressure. There may be an increased chance of retinal detachment. Pre-existing retinal diseases such as macular degeneration may limit your vision after the treatment. If your vision has decreased since you had cataract surgery, we recommend that you have a complete eye exam. We will determine if the YAG laser may be your key to improved vision. If you have had cataract surgery and your vision becomes cloudy again you may have a secondary cataract. 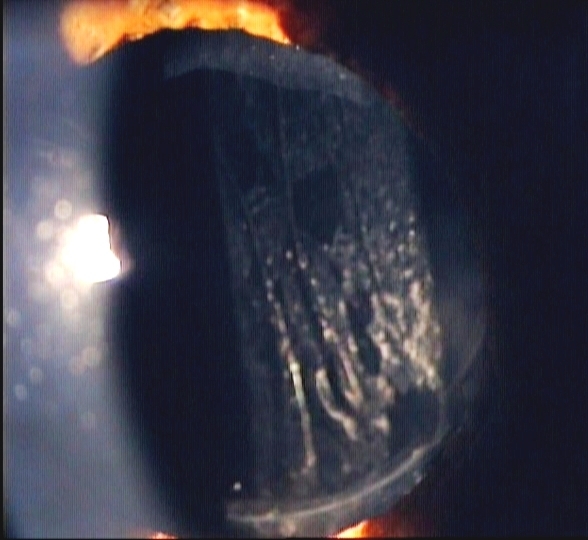 Secondary cataracts occur when the back membrane of the lens, which is left in place after surgery, becomes cloudy. With YAG laser surgery vision blurred by secondary cataracts can be restored in minutes with no needles, no stitches, and no healing time. 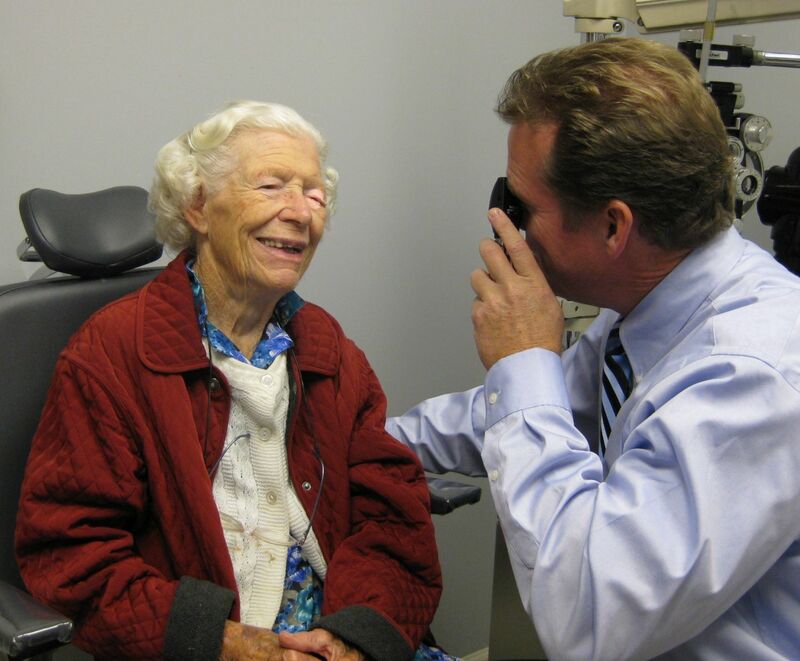 If your vision has decreased since your cataract surgery, we recommend you have a complete eye examination. A secondary cataract can only form ONCE. It never returns once it is correctly treated with the YAG Laser.